Aloe aristata is easily identified by the white markings on its leaf surfaces and the thin pointed leaves. Aloe aristata has no papery bracts along the peduncle, a characteristic it does not share with other dwarf aloes. 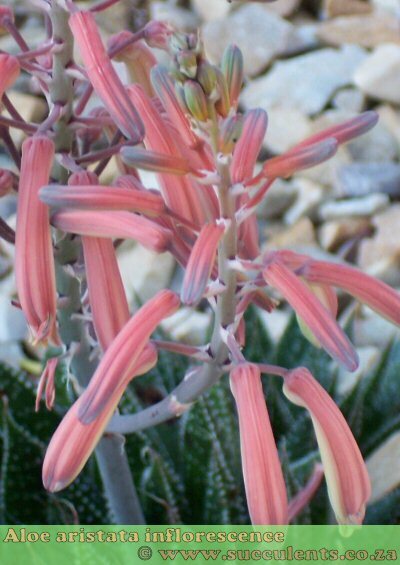 When not flowering Aloe aristata is often mistaken for a Haworthia specie. The specie name 'aristata' means 'awned' which refers to the awn shape of the leaves. Common Names: Serelei which means slippery one. Torch Plant, Lace Aloe. Status: Not threatened, extinct in certain locations. Distribution: Found in the Eastern and western Cape, Orange Free State and Lesotho. Stem: Plants are stemless and form clumps of up to twelve rosettes that are between 100mm and 150mm in diamater. Leaves: Leaves are narrow and triangular in shape and taper of into long dry awns. Leavesare dark-green in colour. Leaf surfaces are marked small white dots that may be tuberculate, especially near the leaf tips. Leaf margins are armed with soft small white teeth that are 1mm-2mm in length. Inflorescence: Complex inflorescence that is 700mm in height and branched into 2 to 6 racemes with 20-30 flowers on each raceme. No papery bracts present on the raceme. Flower: Flowers are a dull-red or pinkish colour, tubulr in shape and slightly curved down. Basal swelling is present due to fused petals around the ovary. Flowering Time: Plants flower during the month of November. Light: Light-shade to full sun. Watering: Will tolerate slight overwatering and drought conditions. Aloe aristata does well in cultivation especially rockeries and in containers. 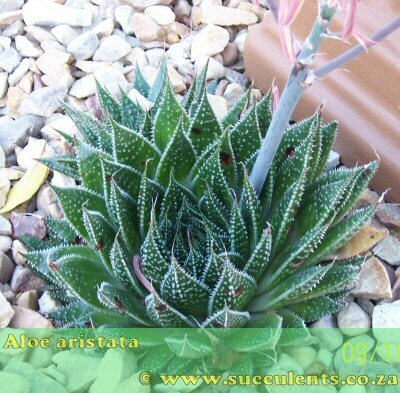 Aloe aristata produces many offsets that can be removed from the mother plant. Allow a day or two so that the wounds on the plants can callus, this will help prevent rot from setting in.